Recognized as one of the most successful folk rock duos of the 70s, Brewer & Shipley have remained true to their original form for an astonishing five decades. Although best known for their Top 10 signature song, "One Toke Over The Line," which permanently etched their names in rock history by becoming an anthem of the 70s counterculture, Michael Brewer and Tom Shipley were by no means a one trick pony. In all, the duo landed three singles on the Billboard charts and had the pleasure of working with such notables as Mike Bloomfield, Leon Russell, Jimmy Messina, and the late Jerry Garcia. In 1979 after more than a decade of writing, traveling, and performing, Brewer and Shipley parted company to pursue personal interests. Michael Brewer continued to make music, recording a solo album for Full Moon Records entitled "Beauty Lies.” Tom Shipley began working as a television producer/director, eventually forming his own production company (Tarkio Communications). He later founded the Oral History of The Ozarks Project, a not-profit organization producing documentaries about life in the Missouri Ozarks. In 1986, Brewer & Shipley reunited and began writing and performing together again. They continue to tour and record regularly, having released two albums of original material since reuniting. Brewer & Shipley are known for their intricate guitar work, vocal harmonies, and socially conscious lyrics which reflected the concerns of their generation. 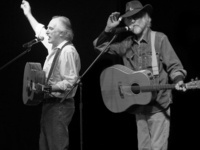 With Tom Shipley’s connection to the Rolla area and Missouri S&T, what better way to celebrate Brewer and Shipley’s 50th anniversary than to bring this classic American folk rock duo to the Leach Theatre stage.